Born in Ordrup, Denmark, Henningsen studied at the Danish College of Technology from 1911-17. By 1920 he was a practicing architect in Copenhagen, designing restaurants, residences, and factories while also pursuing other areas of interest; he worked as a journalist, playwright, and edited a Danish cultural review. In 1924, the Danish lighting firm, Louis Poulsen & Co. hired him, and it was the lighting fixtures he designed for this company that launched his international reputation. His Poulsen lighting for the 1925 Paris Exposition won a gold medal, and a year later, the first production versions of his PH lamp series debuted as a lighting commission for the new Forum exhibition building in Copenhagen. The... more. We have 3 objects that Poul Henningsen has been involved with. 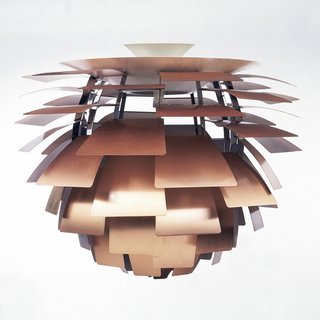 Louis Poulsen & Co. A/S.